Legions of guys from fathers and sons, brothers, college roommates, neighbors and poker pals swear by the guy getaway as a refuge where shirts stay permanently un-tucked, beards are in perpetual stubble, an occasional cigar is smoked, and in the truest testament to testosterone, other guys laugh at our bad jokes. 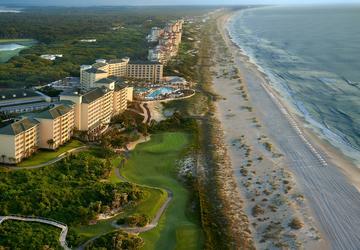 For D.C. bro’s looking to escape winter’s coming misery, there’s no finer destination than Florida’s Amelia Island. A scant two-hour nonstop flight from the District into Jacksonville and your crew is a short drive from Amelia. Here, extra-wide beaches, six championship caliber golf courses, salt-marsh kayaking, paddle boarding, canoeing, deep sea fishing, Petanqué (more on this later), serious seafood, local craft beers and spirits all combine to deliver the ultimate man-cation. 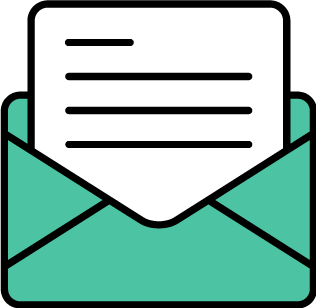 Here’s a roundup on what not to miss. 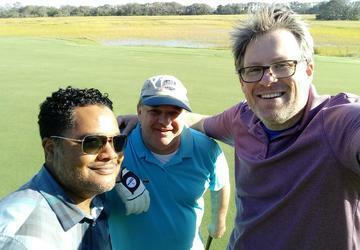 Guys get their golf on at six courses on the island including three high-wattage designs at the Omni Amelia Island Plantation Resort. Pete Dye’s testy Oak Marsh is the most notable track, featuring clever green-side optic tricks meant to deceive overly-aggressive play and reward meticulous study of the on-cart GPS system marking distances to hazards as well as pin placement. The back nine runs several holes along the golden reed marshland where egrets, herons, flamingos and loons are the only sentient beings you’ll likely encounter on early morning rounds. Long Point, Tom Fazio’s tough yet fair design, frames fairways amidst large ocean-side dunes, burled oaks dripping with Spanish moss and ever-present water hazards found in meandering creeks and salt marsh. The big pond is in play on several holes on the Ocean Links, a Bobby Weed design. Pristine conditioning, well-regulated pace of play and true-putting greens make golf at these courses must plays. Other layouts not to miss include The Golf Club of Amelia Island found on property at the Ritz-Carlton, Amelia River Golf Club, and the 27-hole pub-links, Fernandina Beach Golf Club. Looking to get the guys out on the open water? 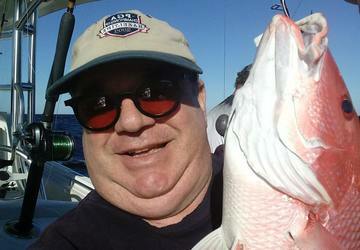 Sport fishing is serious fun off Amelia’s shores. Terry and T.D. Lacoss at Amelia Angler Outfitters know exactly where the red fish, snapper, marlin, and wahoo hang out. They’ll take care of everything for your crew from gear and bait to drinks and snacks as you head out for a half or full day adventure in one of their 35-foot Triton twin-engine boats. Into trout, striped or large-mouth bass? This father/son championship fishing duo readily shares their knowledge with anglers in area brackish rivers and backwaters that offer exposure to saltwater estuaries, flats and inlets where light-tackle fishing is off-the-hook fun. 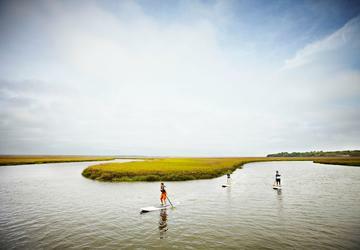 Eco-touring the salt water marshes is a great workout in a kayak, canoe or on a paddle board. 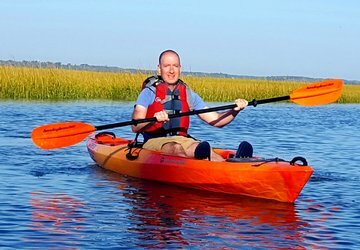 Amelia Island Kayak Excursions and Back Water-Cat Adventure are among the many island outfitters that will hook you up with gear and naturalist -led guided tours – you may even spot dolphins and manatee on your adventure. Combine grapefruit-sized steel balls, golden amber beverages and a bit of boyish bravado and your crew is well on their way to enjoying Petanqué – a European boule-sport similar to Bocce. Fernandina Beach is ground-zero in America for this strangely addictive (drinking) game that is “learned in 10 minutes, yet takes a lifetime to master,” according to Phillipe Boets, past president of Petanqué America and local celebrity. Pick-up games are held weekly year-round Wednesdays from 11 a.m. to 3 p.m. and Saturdays from 9 a.m. to noon at the open Petanqué pitch on South Front Street, just south of Centre Street in downtown Fernandina Beach. Instruction, gear and tall-tales are free, simply supply your own libations – discretely of course. 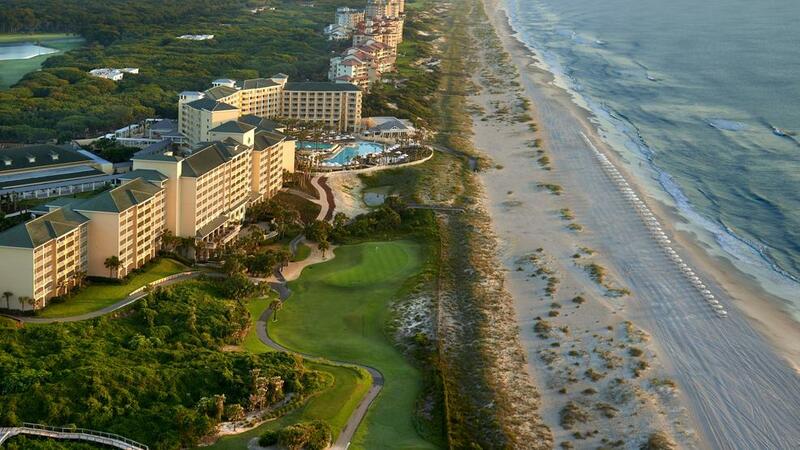 Omni Amelia Island Plantation Resort features 404 ocean-view rooms and one, two and three-bedroom condos alongside scads of guilty-guy pleasures throughout their 1350-acre-oceanside property. Foremost among them is the beach with one of the widest shorelines in the U.S. – the hard-pack fine-grain sand is nearly 75 yards from shore to surf at low tide – Guys run out of energy well before unimpeded coastline on early morning runs. The Omni has ten restaurants and lounges on property – Our favorite is Oceanside, the casual seafood specialty restaurant where dinner in flip-flops and shorts belie the sophisticated fare served here. Salt-baked prawns with pressed potatoes are briny and succulent bathed in a garlicky butter sauce. Oceanside’s chefs do the work for you with whole Florida lobster, lightly sautéed, removed from the shell and stuffed back in the tail amidst an aged-rum cream sauce. The seafood mixed grill features tender octopus, scallops, prawns and the local catch – often grouper – alongside chorizo and spiced carrot. Have dessert on the beach – the Omni’s s’more set-up surrounds a hand-dug fire-pit with Tiki lamps, beach chairs and everything you need to make your own chocolatey creations – they’ll even supply after dinner drinks. Coral the guys for the Rum & Tequila Experience poolside where more than 100 premium rum and tequila selections are flighted according to your preference – the massive cigar selection in the lobby lounge comes in handy offering smokes from mild to robust. 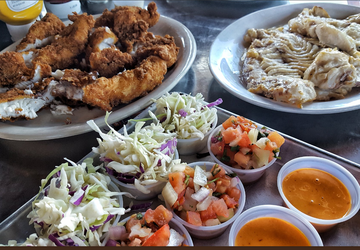 Take your fresh-off-the-boat catch to the Salty Pelican where they’ll fry, blacken or pan sauté your haul and surround it with all the fixings for the best fish tacos in the southeast. Didn’t go fishing? No problem, the Pelican has plenty of their own grouper, red fish and snapper complimenting a fine micro-brew selection for a lazy lunch on the edge of Cumberland Sound. Timoti’s Seafood Shak is a Fernandina Beach institution with lobster rolls, shrimp baskets, gumbo and outa-site hush-puppies shining on their seafood studded menu. Order inside at this tiny dive and pull up a picnic table outside with the locals – Lunch is a friendly conversation starter and ice breaker. When the guys are ready to clean-up and splurge a bit, head over to the Lobby Bar at the Ritz-Carlton, Amelia Island. 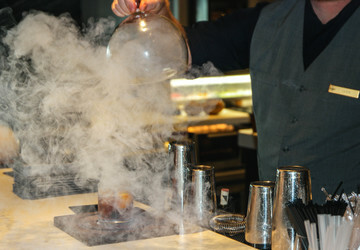 Nightly “First Call” at 5 p.m. features that day’s custom-infused bourbon – think herbs, citrus and spice, the guys can enjoy neat or in their legendary smoked Old Fashioned. After drinks take on the chef’s adventure tasting menu at SALT, one of only a handful of Five-Diamond restaurants in Florida. Multi-course menus shift daily based on the freshest ingredients available to the culinary team. This diner enjoyed butternut squash soup with cranberry, spiced pecans and vanilla foam, pink prawn and diver scallops, Georgia grits and green tomato marmalade and a coffee rubbed rib-eye, each expertly paired with a hand chosen wine from their cellar. Don’t leave the island without making a stop at Marlin & Barrel. 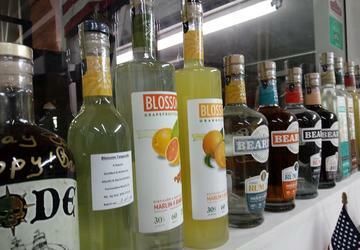 This craft distiller is gaining recognition for their small batch vodka, rum and ‘cellos. The Blossom Orangecello with hand zested Florida oranges will make you rethink your next Screwdriver and the Smoked Pepper Vodka made with molasses sugar and local chili peppers packs some sweet heat for your next Bloody Mary.